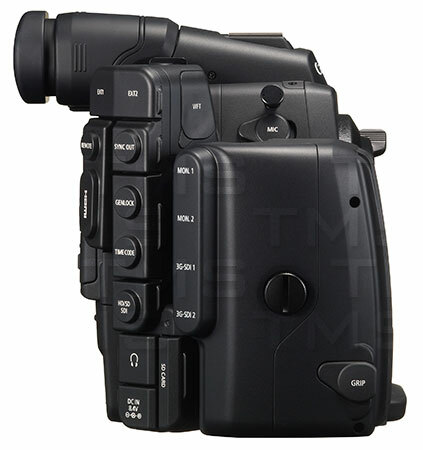 This is the EF-Mount Camcorder, the C500 is also available in PL-Mount. The Canon Cinema EOS C500 is a 4K Digital Cinema Camera built on the same foundation as the C300. Featuring a Super 35, 8.85-megapixel CMOS Image Sensor, and paired with a DIGIC DV II Image Processor, this camera offers two forms of 4K origination. Productions can dynamically select DCI (SMPTE 2048-1:2011 standard) or the alternative television-centric Quad-HD (SMPTE 2036-1:2009 and ITU-R BT.1769 standards) source image formats. 4K & 2K Video Acquisition. The Canon C500 supports both 4K and 2K image resolutions with a range of 10-bit and 12-bit imaging modes. It offers two forms of 4K origination: users can dynamically select either the DCI source-image format – SMPTE 2048-1:2011 standard – or the alternative, TV-centric Quad-HD source-image format – SMPTE 2036-1:2009 and ITU-R BT.1769 standards. With 2K/Full HD, images can be output at either RGB 4:4:4 12-bit/10-bit or YCC 4:2:2 10-bit data for both 59.94Hz and 50Hz projects at up to 50 Mbps rates. For added flexibility, the C500 lets users select uncompressed Canon RAW output for use in both 4K and 2K productions. Instead of utilizing the built-in Compact Flash/CF storage media, Canon RAW-format output is delivered to external recording systems via built-in dual 3G-SDI ports. Dual uncompressed HD-SDI outputs support external monitoring. To provide proxy video sources for offline non-linear video editing systems, HD content can also be written simultaneously to dual, onboard CF cards. Because of data-bandwidth restrictions, recording onto the EOS C500's built-in Compact Flash/CF card drive are made at Full HD resolutions. As well as serving as a primary source for video capture, HD images streamed onto the CF card can be used as proxies for off-line editorial. 4K Super 35mm Image Sensor. 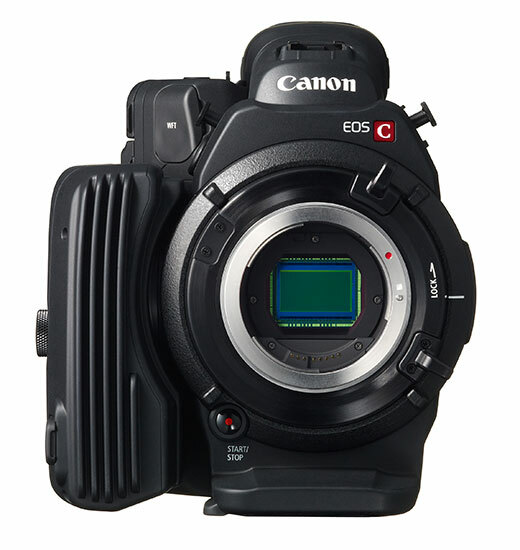 The Canon C500 Cinema Camera was designed with a Super 35mm 16:9 CMOS Sensor that delivers 8.85-megapixel images. During data transfer, the uncompressed information from the EOS C500's 4096x2160 Bayer-type CMOS image sensor is read out and transferred as RAW data to the 3G-SDI output. The singular sensor of the C500 maintains a wide pixel pitch, thereby enhancing the sensitivity and reducing noise. Canon MPEG-2 4:2:2 50Mbps XF Codec. 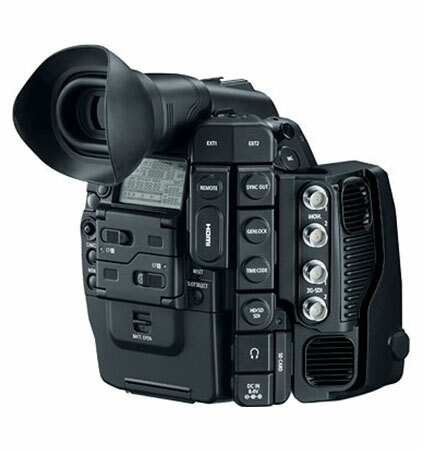 For trouble-free exchange of video and audio material, the EOS C500 uses the industry-standard Material Exchange Format (MXF) for its internal recording file structure. With MXF, video and audio are interwrapped into a single file, together with important metadata about the project. In addition to providing the highest level of compatibility with non-linear editing/NLE systems, use of MXF-format files offers integration with high-end, networked DAM (Digital Asset Management) and MAM (Media Asset Management) systems used by many TV networks and production studios. Full Manual Control. Canon’s C500 offers full manual control of all functions: iris, shutter speed, gain, zoom, focus, audio levels. The camera’s menu gives you access to custom picture settings, custom functions, and custom display options to tailor the C500 to your production. The Canon Cinema EOS C500 was discontinued shortly after the release of the Canon Cinema EOS C700.